iPhone owners rejoice. The much-awaited iOS Ballistics App for the Kestrel LiNK Weather Meter is now available. Now you can sync your 5700 Series Kestrel wirelessly with your iPhone, iPod, or iPad. With Apple iOS devices being so popular among serious shooters, this is an important software release. Bryan Litz of Applied Ballistics was proud to announce the new development: “Kestrel LiNK Ballistics is now available for iOS! It has been available for Android, and was also recently updated to fix some issues. Android users should be on version 1.67 by now. We say thank you to those who have been patiently waiting for the iOS version”. The software is a FREE download from the Apple App Store. For supporting info and Users’ Guides for both iOS and Android versions, visit the Applied Ballistics Resource Site. This App is designed to work with the new 5700-series Kestrel Elite Weather Meter (5700AL) or Kestrel Sportsman Weather Meter (5700SL) with LiNK, powered by Bluetooth Smart. Share the post "Released — Applied Ballistics Kestrel LiNK Ballistics App for iOS"
Here is an interesting new measuring device from L.E. Wilson, makers of precision hand dies, case trimmers, and other precision tools. This new Case Gage Depth Micrometer measures shoulder “bump”, so you can determine your headspace both before and after Full-Length sizing. With this Depth Micrometer, you can ascertain exactly how much your FL-sizing die is pushing back the shoulder during the sizing process. While you can measure shoulder setback with comparators on calipers, this Wilson Depth Mic is much more handy. Just place your sized round in the base gage and then slip the micrometer over the top. Take a measurement before FL sizing and then, after sizing, click the micrometer top to verify the amount of shoulder set-back. The measurement is quick and repeatable — very slick. This is one more nice product from the folks at L.E. Wilson. The $110.00 tool comes with a Gage Block and micrometer top with .001 gradations. 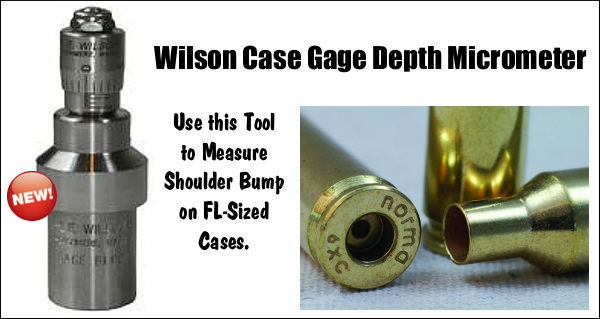 The Depth Mic top is compatible with all other Wilson case L.E. Wilson Gages (one size works for all). Share the post "New Case Gage Depth Micrometer from L.E. Wilson"